Whether you’re an experienced serial yacht owner or are just setting out on your maiden voyage, finding the perfect place to berth your yacht can make or break a superyacht vacation. With a number of beautiful and unique locations throughout the eastern Mediterranean, marina management group D-Marin offers something every yacht owner will love - click through to see our pick of the best… 1. 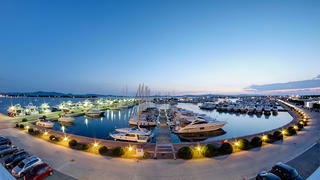 D-Marin Mandalina Located in a naturally protected corner of the Dalmatian coast at the ancient city of Šibenik, D-Marin Mandalina is the only marina in Croatia to be awarded five gold anchors from the Yacht Harbour Association. With space for 79 superyachts of up to 140 metres in length, Mandalina is also an official port of entry to Croatia and just 40 minutes from Split and Zadar International Airports, making it ideal whether you’re cruising the Med or meeting your yacht. 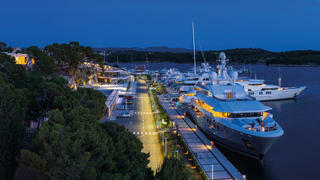 Located in a naturally protected corner of the Dalmatian coast at the ancient city of Šibenik, D-Marin Mandalina is the only marina in Croatia to be awarded five gold anchors from the Yacht Harbour Association. With space for 79 superyachts of up to 140 metres in length, Mandalina is also an official port of entry to Croatia and just 40 minutes from Split and Zadar International Airports, making it ideal whether you’re cruising the Med or meeting your yacht. 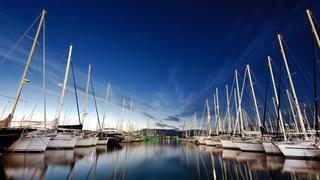 Boasting a huge 1,200 berths for yachts of up to 80 metres, D-Marin Dalmacija is Croatia’s largest marina and lies just a few miles south of the port town of Zadar and its international airport. A stones throw from the Dalmatian coast’s famous archipelago, it is the perfect base from which to explore this stunning cruising ground without compromising on luxury. 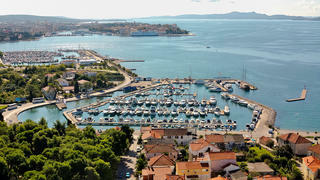 With 177 berths for yachts up to 30 metres, this pretty boutique marina lies on the west coast of the historic city of Zadar, Croatia. Just 13km from Zadar International Airport and boasting a stunning cruising ground with easy access to the Italian coast, this charming, intimate marina is the perfect base from which to discover the delights of Croatia’s Dalmatian coast. 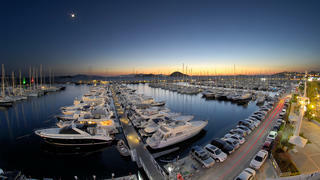 For those looking to add a little culture to their superyacht vacation there couldn’t be a better marina than Zea. Founded in the early 5th Century B.C. 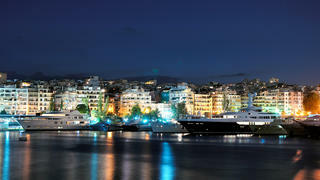 as a war harbour near the main port of Piraeus in Athens, Zea is now a favourite with those looking to combine the history of the mainland with scenic cruising around the Saronic Gulf and Cyclades islands. Thanks to a complete renovation for the 2004 Olympic Games, Zea Marina is able to accommodate yachts of 150+ metres on both floating and permanent pontoons. A brilliant base from which to explore the jewels of the Ionian Sea, Lefkas Marina offers 620 berths for yachts up to 45 metres on its pretty namesake island. A popular cruising ground for charters and private yachts alike, Lefkas offers good transport links to Aktion International Airport as well as easy accessibility to the town’s vibrant shopping area and the varied attractions of the Greek mainland. A popular trade link between the Adriatic and Mediterranean for over 400 years, the Bay of Gouvia on the Greek island of Corfu is now the destination of choice for many superyachts thanks to its balmy climate and unbeatable scenery. 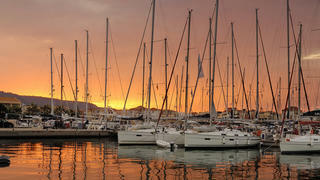 With berths for yachts of 80+ metres, Gouvia Marina is a popular choice for both sailing and motor yachts thanks to its regatta-friendly environment and close proximity to the island’s world-class golf course, water sports facilities, tennis clubs, restaurants and bars. 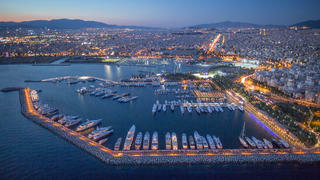 Located just a few kilometres from the ancient city of Athens, the multi-award winning Flisvos Marina in Paleo Faliro prides itself on providing unparalleled levels of service for large superyachts. With 303 berths dedicated exclusively to yachts of up to 180 metres, Flisvos also offers outstanding facilities for owners and crew alike, including a cosmopolitan promenade with fine dining and a number of special events year round among the marina's lush greenery. Flisvos combines the stunning backdrop of the Saronic Gulf with easy access to the Aegean Islands and Athens' main attractions – including the Acropolis and Archaeological Museum – to guarantee a vacation you won’t forget. A must-visit destination in the Adriatic, there are few more picturesque places to berth than the Dukley Marina Budva in Montenegro. Named for the Budva Riviera in which it is located, the marina offers 300 berths for yachts up to 70 metres and is located close to the charming cultural attractions of the Old Town while the bustling modern city, with its fine dining restaurants, trendy bars, theatres and festivals, is mere minutes away. 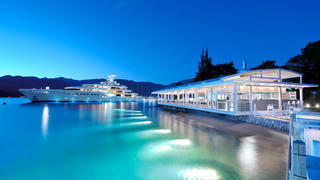 For those meeting their yacht Dukley Marina Budva is a short drive from Tivat and Podgorica International airports while those on superyacht cruises are sure to be impressed by the beautiful Dukley Gardens, beach club, Dukley Residences, boutiques, bars and restaurants. A must-visit destination in the Adriatic, there are few more picturesque places to berth than the Dukley Marina Budva in Montenegro. Named for the Budva Riviera in which it is located, the marina offers 300 berths for yachts up to 70 metres and is located close to the charming cultural attractions of the Old Town while the bustling modern city, with its fine dining restaurants, trendy bars, theatres and festivals, is mere minutes away. 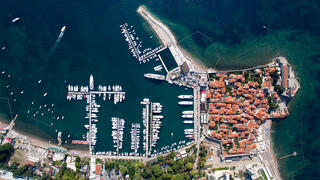 For those meeting their yacht Dukley Marina Budva is a short drive from Tivat and Podgorica International airports while those on superyacht cruises are sure to be impressed by the beautiful Dukley Gardens, beach club, Dukley Residences, boutiques, bars and restaurants. One of D-Marin’s largest marinas, Didim offers space for 576 yachts - with 90 spaces reserved for superyachts of up to 70 metres – at is state-of-the-art facilities on Turkey’s Aegean Coast. Part of the D-Marin family since 2009, its five star services make it a favourite with owners, captain and crew alike while its proximity to Bodrum-Milas International Airport, shipyard facilities and official port of entry status make it a brilliant homeport for local owners. Situated on the stunning Bodrum Peninsula, and only 20km away from the buzzing city itself, D-Marin’s award-winning flagship marina provides the perfect combination of yachting luxury and on-shore excitement. 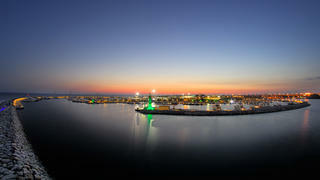 Able to accommodate 550 yachts of up to 75 metres, attractions include high-end boutiques, fine dining restaurants and the world-famous nightlife at nearby Türkbükü. Nestled among the unspoilt beaches, beautiful islands and untouched pine forests of Turkey’s Mediterranean coast, D-Marin Göcek is a paradise for both motor and sailing yacht owners. Located in a registered area of special protection and one of Turkey’s safest natural harbours, sustainable design and pro-active environmental management means guests enjoy unparalleled facilities without any damage to Göcek’s natural beauty. Capable of hosting yachts up to 70 metres, the marina also offers close proximity to the city’s restaurants, bars and cafes as well as being home to a number of prestigious regattas.